New Honda City 2011 Vs Maruti SX4 Petrol– Which Is A Better Sedan And Why? New Honda City 2011 has been recently launched by Honda SIEL In India at a starting price of Rs. 6.99 lakhs for new corporate variant. The City has breached the price tags of Maruti SX4 petrol base variant which is priced at Rs. 7 Lakhs ex-showroom Delhi. This price change will have some significant impact on decision making of a sedan buyer in this price segment. In continuation to our car comparison series on Car Blog India, we will compare these two legendary sedans of this segment – New Honda City 2011 Vs Maruti SX4 Petrol. We have already compared new Honda City with Hyundai Verna Fluidic Petrol here. Maruti SX4 is longer, wider and taller, so it’s a larger car in every dimensions, but the wheelbase of City is longer. In crust, Maruti SX4 is more of a rounded curve design with less character lines and looks slightly dated. But with its larger dimensions and aggressive stance, it does make its presence felt. Honda on the other hand looks much more sophisticated, more stylish, pleasing design with more chrome, much better design elements, higher build quality and more classy car. Simply going by a glance, Honda City is a much better looking car. So my vote for exteriors goes to New Honda City 2011. As a matter of fact, the older 2008 Honda City also looks more appealing when compared to the SX4. On the Interiors, Maruti SX4 does feel very spacious and soothing with good colour tones, but the quality of plastics is just above average, not as good as I would expect in a car of this price. Apart from that seats are very comfortable, interior features are good, styling is bit simplistic and space is ample. Honda City on the interiors feels much more sporty compared to the SX4. The quality of plastics is much better and new leather upholstery feels quite premium. Some of the features are missing like the automatic climate control event in the top end variant, but it does offer electric sunroof which is first in segment feature is no car in this price band offers sunroof. If I have the choice between a City and SX4 Interiors, I would pick City Interiors. The engine of New Honda City 2011 is much superior to SX4’s engine in terms of power, fuel efficiency and because of lower kerb weight of Honda City, the overall power to weight ratio of the City is also significantly better than the Maruti SX4. So Honda City Engine is a clear winner in this department. Maruti SX4 is well known for its good handling characteristics. The well tuned suspension of SX4 along with high ride height, high ground Clarence and large tyres gives it very good ride and handling characteristics. Honda City on the other hand is a very refined and precise handler as well. Its one of the best handling cars in its segment and in no way less than the Maruti SX4. It is very difficult to call one better than the other in terms of ride and handling characteristics, so I call it a tie. The newly added Corporate variant of Honda City is priced Rs. 1000 lower than the Maruti SX4 which comes out to be virtually the same price point. Comparing these two variants on features, the SX4 seems more loaded with features like keyless entry, body coloured door handles and outside rear view mirrors which are missing in City corporate. Also SX4 offers integrated Audio system with CD / USB / Radio with 4 speakers and 2 tweeters, beige interiors. But on the other hand Honda City offers much better engine with better fuel economy, better interior and exterior styling. Most importantly, City corporate edition comes fully loaded with the safety features including ABS with EBD, dual airbags at front. G-Con Strength technology etc. In my opinion, City corporate is a better pick as it’s a better preforming and safer car compared to the Maruti SX4 Vxi. If we go one variant above in both the cars, the Maruti Zxi is the fully loaded variant in manual transmission options while the City E MT is second out of 4 manual transmission trims. In this variant, SX4 adds automatic climate control, driver seat height adjustment feature, silver finished inside door handles, steering mounted audio controls, larger 16 inch alloy wheels, front fog lamps, dual airbags, ABS and EBD etc. Whereas City E over City Corporate adds body coloured door handles, outside mirrors, Beige interiors, silver finish on AC knobs, Integrated Audio system with 2speakers only and speed volume control, aluminum finish central console etc. In areas where City E MT lags behind SX4 Zxi MT is the steering mounted audio controls, 4 less speakers in audio system in SX4 while City has 2, SX4 has 16 inch alloy wheels while City has 15 inch steel wheels, no keyless entry in City, driver seat height adjustment etc. However, the plus points of the City remain better performing engine, better looking interiors and exteriors, superior build quality and better fuel economy. To pick between City E MT and SX4 Zxi MT is a choice between features and performance as the price difference is mere Rs. 5000. I would go for City between these two variants. New Honda City 2011 S variant over the E variant adds alloy wheels, more chrome on the interiors, steering mounted audio controls, rear speakers, stereo system remote control, driver seat height adjustment, more sporty steering with silver finish, more chrome on hand brake lever, keyless entry system, front armrest, coat hangers, seat pockets behind front passenger seat etc. While the SX4 leather edition adds leather upholstery. 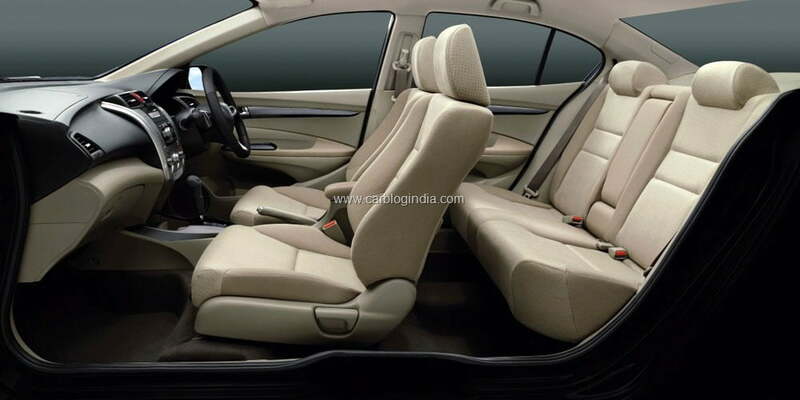 In terms of features, Honda City S comes up to the feature levels of SX4 Leather except for the fact that City has fabric upholstery while the SX4 has leather one. Also the SX4 leather costs Rs. 11,000 less. So its again a choice between features and performance. I would again pick City. In case we go one more variant up on City V from S, it adds fog lamps, new 10 spoke alloy wheels, turn indicators on outside rear view mirrors, exhaust pipe finishing chrome insert, tweeters in audio system, seat pockets at rear of both front seats, cruise control feature. Out of all these additions, the turn indicators, new alloys and cruise control are very distinctive features which are unique points of the City. However, it comes at a premium of about Rs. 61,000 over the SX4 Zxi MT with leather upholstery. So if you don’t drive often on highways, you probably can do without the cruise control feature. However, if you frequently drive long distances on good roads, cruise control is a very pleasing comfort feature to have. Depends on you, purely from value for money point of view, the SX4 seems more lucrative if your needs does not include a cruise control system. Since the Honda City offers the automatic transmission only with the V trim and not with E and S, it does cost over Rs. 1 Lakh higher than the Maruti SX4 ZXi ! This is a huge difference, but for that difference, the City comes with cruise control system, 5 speed automatic against the 4 speed auto of SX4, better fuel economy of City AT at over 15 KMPL as per ARAI data while SX4 automatic delivers 12.6 KMPL. Also the performance and interior and exterior qualities of City are better than the SX4. On the plus side, SX4 offers larger alloy wheels, automatic climate control etc. So if you are looking for a lower priced automatic sedan with more features, SX4 is a better choice, however if you are willing to spend over 1 Lakh extra to get a better engine and transmission system with better mileage and performance, along with the comfort of Cruise control, Honda City V AT will please you better. Maruti SX4 ZXi AT with leather upholstery is Rs. 34,000 pricier than the fabric upholstery variant. It’s a matter of comfort preference whether you prefer leather over fabric or otherwise. Rest of the features remain same. Comparing it to Honda City V AT, the choice still remains between a lower priced car will more features or higher priced car with superior performance and economy. We are not comparing the Sunroof models with SX4 as the SX4 does not offer these features. The premium of Electric Sun roof over corresponding non-sunroof cars is about Rs. 80,000 which is not a deal breaker in this segment, rather this is an option which is not present in any other car in this price band, so it will give customer a choice to have a sunroof equipped sedan for the price premium. If you got passion for it and money to spend on it, then it’s a feature worth paying for. Honda City is a better choice in most of the variants and out-performs the SX4 in terms of safety features on the base variants, fuel economy, engine performance and aesthetic appeal. However, SX4 has an advantage of stronger after sales network and Maruti brand name in India. My pick is Honda City 2011.